Invented by engineer Alan Adler, of Aerobie Frisbee fame, the AeroPress has, fittingly, inspired crazy ingenuity in variety of brew methods. The Aeropress Coffee Maker gives you an extraordinary cup of coffee with every single brew. It utilizes total immersion and gentle pressure to produce a thick and luscious brew that awakens. 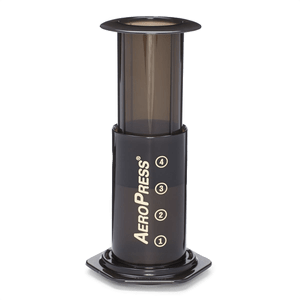 Each serving of coffee made with the Aeropress Coffee Maker provides you with a concentrated blend that you can take as is, or add water, sugar, cream, or creamer -- all according to your taste.